On Wednesday night, with the infield drawn in to protect against a bunt or slow grounder, Ichiro Suzuki hit a soft liner during the first inning for the 4,000th hit of his career. The hit was monumental but the game was not won until newly acquired Rafael Soriano hit a tie-breaking two-run home run in the eighth inning to give the New York Yankees their 10th victory in their past 13 games. Ichiro’s single past the dive of Brett Lawrie at third base gave Ichiro the obscure milestone. He personally felt the milestone was special to him, but was not expecting his teammates to all run out of the dugout to congratulate him. 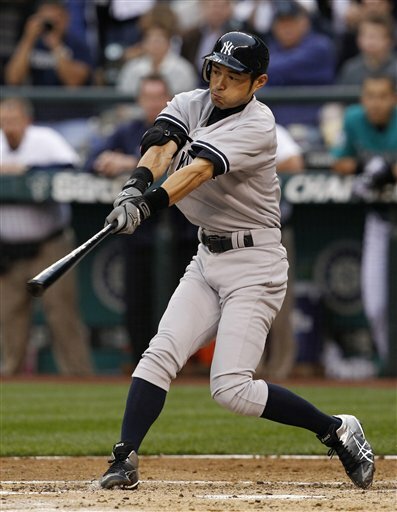 Combining the hits he had in the Pacific League in Japan with his nearly 2,800 in the majors Ichiro became only the third player in professional baseball worldwide to reach the 4,000 hit plateau. At the same time, his teammates ran onto the field to congratulate him, a videotaped message from Ken Griffey Jr. his former teammate was played on the video scoreboard congratulating him. His combined total hits are difficult to put into perspective. The two other major leaguers that reached that plateau are Ty Cobb and Pete Rose. However, Ichiro’s is much different. One statistician was quick to point out that only five players have 4,000 hits in their combined minor league and major league careers. They are Cobb, Rose, Hank Aaron, Stan Musial and Jigger Statz. Ichiro’s manager Joe Girardi was quick to say how unbelievable he feels the feat is. Girardi said he did not have 4,000 hits even if you went back to his Little League career all the way through his pro career. The milestone by Ichiro was a side-highlight to the win by the Yankees, which moved them just four games behind the second wildcard spot.